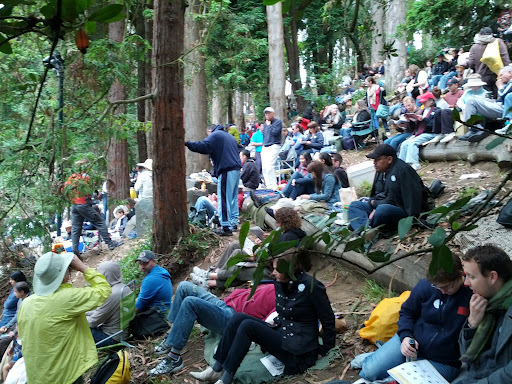 Natasha had the San Francisco Symphony play Beethoven for her picnic in Stern Grove. Now, that’s the way to celebrate a birthday. Of course, most of the thousands of people who shared the grove with us yesterday had no idea they were helping Natasha celebrate her birthday, and it’s unlikely anyone in the Symphony even knows who Natasha is. But much as the success of a rain dance rests entirely on its timing, so does the placement of a birthday picnic. There was home-made tandoori chicken, sliced cucumbers, cherries and apricots. Fresh bread. And (not surprisingly) there was pie. There was a bottle of wine to be passed around. And there was a sea of humanity, spread out on the lawn below, perched beside us on the ledges, and disappearing up into the woods above us. Oh yes, and there was Beethoven. It’s a wonderful thing, sharing the Ninth Symphony with friends in this setting. 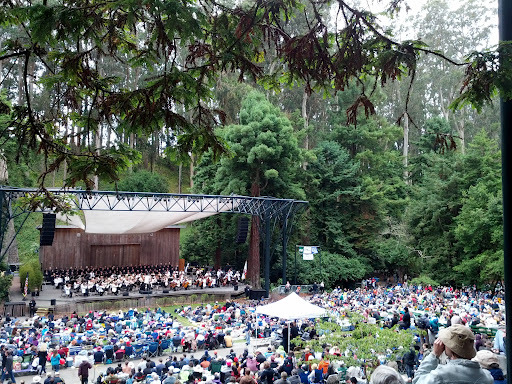 Not the stuffy pin-drop concert hall, but outdoors, with hawks screeching by overhead, among ancient eucalyptus that seem to reach up and touch the gray mist sky above. Babies crying somewhere. Natasha and Michael ba-ba-bum-ba-bum-ba-bum’ing along with the galloping second movement, hardly able to restrain themselves from dancing. How could I have never realized it before: Beethoven was not meant to be listened to indoors. It was a glorious afternoon.